A book hook is a statement or question designed to generate immediate curiosity and make the reader desire to know more about a book. Why are hooks important? Language is the power of the book sale. You’re not selling books to machines. You’re selling books to humans who make decisions based on the language they read or hear. A book hook harnesses the power of language to naturally make people notice and want more. 1. Imagine that your book is about to become a movie. Every author dreams of seeing their book turn into a movie, whether it’s a fiction drama or non-fiction documentary. But, if that opportunity actually came true, you would need to think like a screenwriter, instead of an author. Screenwriters pitch movie ideas to the Hollywood studios every day to win bids for a major motion picture. To be successful, a screenwriter has boil the essence of an entire movie down to one simple idea. For example, if you write fiction, picture your novel as an upcoming major motion picture, such as a thriller, a romantic comedy, or a horror film. How would you grab the reader’s attention in one sentence? If you’ve written a memoir, imagine your book as a dramatic tale on the silver screen. How would you make people curious about your story using one question or statement? If your genre is non-fiction history, education, religion, or self-help, imagine your book as a feature documentary. How would make it sound interesting in one sentence? Think like a screenwriter to get yourself in the right frame of mind to develop a book hook. As a book marketing consultant, I’ve found the “what if I told you” technique helps my clients get into a better mindset for developing hooks. And, for fiction authors, I stress that a good book hook should present a heroic quest and the implied conflict that the protagonist will experience. Every great book hook has this quality in common: You want to know how the story, the history, or the non-fiction advice will play out. Sometimes, it’s easier to create a hook for your book when you see effective examples displayed. 1. What if a suicidal man had an angel show him how his town would turn out if he’d never lived? 2. What if I told you four Jamaicans decided to enter the Winter Olympics as a bobsled team…but had never seen snow? 3. What if you could be debt-free in 12 months, no matter how much you owe? 4. What if you can actually train your brain to win? 5. What if two people who hate each other start anonymously writing each other online and fall in love? 6. What if I told you the amount of rainforest equal to 31 million football fields disappears each year? 7. What if you can learn when to say yes and how to say no without feeling guilty? 8. What if you discovered your entire life was just a computer-generated illusion? 9. What if the first man to walk on Mars suddenly realizes he’ll be the first to die there? 10. What if I told you everyone speaks, but not everyone is heard? Notice how these “what if” questions naturally make you want to know more. That’s the purpose of a book hook. Make people curious. Make them wonder. Make them want to purchase and read what happens next. What if you could wake up every day motivated and excited about your job? This hook attempt is too vague and generic. You can’t tell what makes the book unique. What if I told you everything you know about love is a lie, but the truth may be more than you can handle? This hook attempt sounds unrealistic and trite. It feels too much like an infomercial. What if a teenage girl accidentally time traveled and fell into the body of a rebellious medieval woman who witnessed a murder and fell in love with a nobleman all the while trying to find a way home before she disappears forever? This hook attempt is too long. You’re confused and lost attention by the sentence’s end. What if I you could dance your way to a lasting relationship? This hook attempt is too ambiguous and needs more detail to grab someone’s interest. What if the sinister visit from her deceased high school teacher wasn’t a dream? This hook attempt doesn’t make sense to anyone but the author. I provided these examples to help clarify the mistakes you want to avoid. If your hook attempt is vague, trite, or confusing, it will just be an attempt – not an actual hook. Also, avoid the mistake of using overly-sensational language to generate emotion or intrigue that doesn’t really exist. Empty phrases, such as, “you won’t believe it,” “like you’ve never heard before,” or “the best ever” don’t add value. They just water down a hook to meaningless mush. In addition, I’ve found that many non-fiction authors mistakenly try to teach the reader with their book hook. This problem typically affects academic, religious, or business authors who get enamored with their methodology or curriculum. They struggle to get out of their own head and view their book from the perspective of a skeptical reader. Remember, when most people first see your book, they are apathetic, cynical, or distracted. They don’t care about your methodology, your seven steps for success, your proven plan, or your sacred insights. That’s why you need a hook to get people’s attention. The purpose of a hook is NOT to teach. Instead, the purpose of a hook is to TEASE the reader’s interest in your book. A great hook is easy for people to grasp. There is no confusion or lackluster response. Instead, readers’ feel an emotional desire to know more about a book. 1. 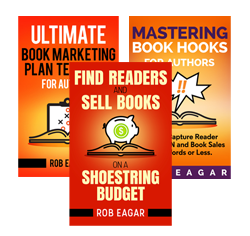 Use the screenwriter or “what if I told you” technique to create your own book hook. 3. If I like your book hook, I’ll add it to my Book Hook Hall of Fame page with your name and book title for everyone to see!